Seaworthy's "Hurricane Warning: A Guide to Protecting Boats and Marinas for Hurricanes" notes that the probability of damage can be reduced considerably by "choosing the most storm-worthy location possible" and making a plan before a hurricane warning is posted. (Sound advice, so far.) The Guide goes on to note that a boat in the water should only be secured in a well-protected marina: "A seawall or sandy spit that normally protects a harbor may not offer any protection in a hurricane." May not offer any protection? After spending a considerable amount of time driving to various marinas after Hurricane Isabel, Seaworthy can now safely say that the last sentence is an understatement—a HUGE understatement. Of the thousands of words that have appeared in Seaworthy concerning hurricane preparation, "choosing the most storm-worthy location possible" are the most critical. Does having a boat in a well-protected harbor guarantee safety? Of course not. But the choice of locations is the single most important decision a boat owner has to make before a storm. It dwarfs all others. In this issue, Seaworthy looks at three marinas that were in Isabel's path. All are well run marinas; well respected and popular with local boaters. All three have management that clearly had given considerable thought to hurricane preparation. All three, thanks to their staffs and boat owners, had been carefully prepared for Isabel. That's where the similarity ends, however. By the end of the storm, the outcomes at the three marinas were completely different. And the difference was their location. Three days before Hurricane Isabel was expected to come ashore, Hartge personnel began calling every one of the 297 boat owners at the yard with a brief reminder: Preparing your boat is your responsibility. Details on hurricane prep, owners were told, had been posted at the yard's website. Hartge's service manager, Luke Frey, said he had been pleasantly surprised at both the size and intensity of the response; later that afternoon a steady stream of cars began pulling into the yard as owners set to work removing biminis, dodgers, dinghies and sails, and adding extra lines and chafe protection to their boats. Several owners moved their boats to nearby hurricane holes—Mill Creek, Whitehall Bay, and the Severn River . A few others had their boats hauled and blocked ashore. Meanwhile, the normal work routine at the 139-year-old boatyard was suspended as Hartge's 35 employees went to work preparing the docks, buildings and grounds. The frenetic activity continued until Thursday afternoon, when most of the employees headed home, leaving only a handful of volunteers at the yard to wait for the rapidly approaching storm. Plans for Isabel began on Monday when Isabel was still off the coast of Georgia . Steuart Chaney, Herrington's president, started making plans to prepare the marina with Alex Persons, Herrington's harbormaster. Chaney described the plans the two eventually made as "elaborate." First, all 1,300 boat owners at Herrington North and South were called, and most came to the marina to prepare their boats. Marina staff walked the docks over and over, noting potential problems. Some boat owners were then given a second call. Dozens of boats—a total of 165 in three days—were hauled and blocked ashore. Chaney said anything on the grounds that "could float or fly" was secured by marina personnel. Windows on buildings were covered with plywood. Just as the storm started coming ashore, danger signs were placed at each dock and the power was cut off. Further south on the James River , personnel at Jordan Point Yacht Haven had also been calling boat owners. Their message was different: Boats either had to be moved to a hurricane hole or they were going to be hauled and blocked ashore. Boats would not be allowed to remain in their slips during Isabel. The reason, according to Mike Winn, Jordan Point 's owner, was that the docks were too vulnerable; several boats had sunk at their slips when Hurricane Fran skirted the area in 1996 and Isabel promised to be a much bigger storm. Winn said he wasn't taking any chances. Several of the owners opted to take their boats to a hurricane hole—a large, well-protected gravel pit further up the James. The remainder were hauled and, by late Wednesday, 80 boats had been blocked ashore in two neat rows facing the water. Slips were now empty. The buildings and grounds had been secured. There was nothing more to do but go home and wait. Friday morning dawned bright and sunny with nary a hint—as long as you were looking skyward—of what had taken place the night before. The ground, however, was a different story; it was carpeted with leaves, hundreds of branches, debris, and fallen trees. Power lines were down. Homes were damaged. And along the shores of the Chesapeake and its many tributaries, water was just beginning to recede from backyards, marina parking lots, and docks. A boat owner who arrived at Hartge early that morning said he saw a kayak being paddled along a dock that was still well below the surface of the water. Even though Hartge sits on relatively high ground, the water had flooded several of the buildings, destroying the paint inventory in the stock room and the welding machine at the yard's rigging shop. As for the boats, a few had been scratched by handholds that jut out from pilings on finger piers, but the damage was minor. Most of the marina's boats were completely untouched. Some of the credit has to go to Hartge volunteers who stayed up all night, first loosening the lines on boats as they rose and then taking up the slack as the surge receded. Ultimately, though, the credit for Hartge's success has to go to the marina's sheltered location. The effort by Hartge staff to protect boats, however commendable, would have been impossible at Herrington North or Jordan Point. A seawall that protected the boats at Herrington was overcome by the surge, exposing boats at the marina's A, B, C, and D docks to breaking waves. Large sections of the docks had been destroyed and some of the boats—a total of eight—were sunk. Many more were damaged. The worst devastation occurred at Jordan Point. During the night, Isabel's eight-foot surge and six-foot breaking waves destroyed the vacant docks and then rose over the banks, lifting all 80 boats off their jack stands and floating them against a hill behind the parking lot. The boats were then bashed against each other for several hours, leaving them in mangled clumps when the surge finally receded. All were damaged and many were a total loss. A few were broken into pieces and strewn about the parking lot. As you might expect, Hartge's Frey was the only one who wasn't talking about major changes, aside from moving equipment to higher ground, after Isabel. At Herrington North, Chaney has begun rebuilding a total of 250 slips with completion scheduled sometime later this summer. A taller seawall will also be replacing the one that was overcome in Isabel. A second seawall, one that will protect the harbor from the southeast, may also be built. Chaney said that the second seawall had been discussed before Isabel and he's confident that the project has the impetus to finally be approved. With new seawalls, boats would be much better protected. If the second seawall isn't built, the only alternative will be to move all of the boats whenever the area is threatened by a hurricane. Jordan Point is also rebuilding; the fixed docks are being replaced with floating docks and taller pilings. There will also be a breakwater at the perimeter, although it won't be sufficiently tall to protect the boats in a significant storm surge. Should another Isabel be forecast, the boats likely would have to be moved, although to where or how has yet to be worked out. Mike Winn says he's just thankful to be rebuilding. The message to boat owners is clear: "A seawall or sandy spit that normally protects a harbor may not offer any protection in a hurricane"… a few small words that somehow don't convey the message. 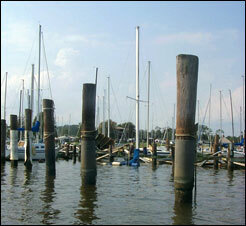 The boats at this marina on Miller Island , Maryland had all been moved ashore to "high ground." Unfortunately, high ground on Miller Island isn't very high. The surge came over the outer breakwater and breaking waves flooded the surrounding property, wreaking havoc with boats and houses. At one point, the entire island was underwater. 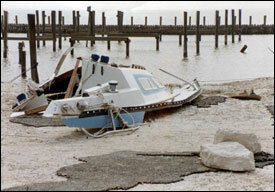 Perhaps the most famous story of marina destruction, occurred at the Houston Yacht Club during Hurricane Alicia in 1983. A storm surge, pushed by 135-mph winds, combined with normal high tides to overcome the low-lying outer seawall. The protected harbor then became an open bay and all of the boats—a total of 141 boats—in the harbor either sank or were carried ashore. As a result of the storm, the Houston Yacht Club put together a remarkably detailed (75 pages) hurricane preparedness plan that must be adhered to by all members. The plan calls for every boat in the outer harbor to be moved or hauled out ashore. The wind blew across the long, unprotected fetch of the James River (that can be seen under the shed) destroying the docks and sheds. Even though all of the boats were damaged, the decision to haul and block them ashore before the storm meant that most would survive. Dan Rutherford, a marine surveyor on the BoatUS Field Catastrophe Team, estimates that 75% of the boats in the parking lot were repairable. Had those same boats remained in the water, all would likely have been bashed against pilings and sunk. Blocking the boats ashore averted another costly problem: pollution from leaking fuel. It's difficult to imagine docks that could be better sheltered than those at Columbia Island Marina in South Arlington, Virginia. 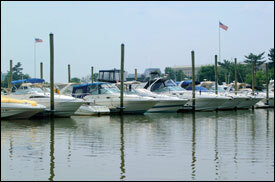 The 382-boat marina is located in a basin that is surrounded on four sides by gently sloping banks and separated from the Potomac River by a long, narrow canal. During Hurricane Isabel, the boats at Columbia Island were well protected from storm's wind and waves. The surge, however, was a different story. All of the marina's boats are moored at floating docks. During the night of September 19, the surge rose an astounding 14', which in years past would have resulted in widespread damage when docks and boats floated free. But when the docks at Columbia Island were rebuilt several years ago, pilings were driven into the bottom that tower 18' above normal water levels. As a result, Isabel's powerful surge remained a comfortable distance—four feet—from the tops of the pilings. The docks stayed put and none of the boats were damaged. Other marinas with floating docks haven't been so lucky. 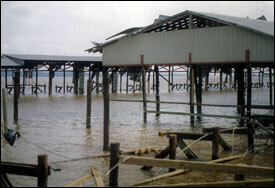 During Hurricane Fran in September 1996, the surge lifted all of Masonboro Boatyards floating piers off their pilings and carried away most of the boats. When the marina was rebuilt the following year, taller pilings were used, which like those at Columbia Island , are 18' above the water. The result is that Masonboro Boatyard is now much more "storm proof."